Today’s lesson explores the seeming contradiction in Scripture that describes a 'royal Messiah’ versus the 'suffering Messiah’. 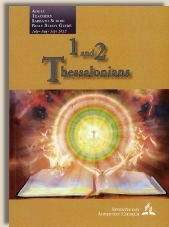 The lesson author asserts that just as in the Jews were confused about the coming of the Messiah we find much the same confusion today about the Second Coming. This is an arrogant position for Adventist to take concerning the expectations of born again Holy Spirit indwelt Christians since it is blatantly not true. The return of the Messiah, our Lord and Savior Jesus Christ, is the central eagerly anticipation event of all Christians. What may or may not have happened in 1844 along with what developed into the Sanctuary Doctrine along with Investigative Judgment and the heresy of believing Satan will become our Scapegoat when he is cast into the Lake of Fire is a critical area of disagreement. Among other things these false doctrines impact the evangelical conservative doctrine of our Assurance of Salvation. Another controversy concerns the Great Controversy Doctrine which asserts several fallacies including the heresy that God must vindicate himself before a watching world. Jesus Christ declared at the cross that all was complete. Satan is nothing more than a created being and never had even a remote chance of prevailing over the Creator. Furthermore, the assurance of this total defeat of Satan that was accomplished at the cross was given to Adam and Eve on the day they sinned. And then there is the Adventist doctrine concerning Sabbath Keeping. Pointing out its association with creation is an Adventist Red Herring because the Sabbath was clearly and specifically established as the sign of the covenant that God established between himself and Israel at Mount Sinai. Since Jesus declares this Old Covenant established at Sinai replaced by a New Covenant, the sign of that previous covenant is also gone. Furthermore, since the indwelling of the Holy Spirit is the sign and seal of the New Covenant, it is heresy to replace the role of the Holy Spirit with Sabbath Keeping in a scenario concerning End Time events and falsely asserting without any biblical support that this is a test of our faith. While there certainly are conflicts between what Adventist teach and the orthodox doctrines of evangelical Christianity, the eagerly anticipated return of our Lord and Savior Jesus Christ is not one of them. Certainly to this day, there is blindness on the part of Israel concerning Jesus as their Suffering Messiah but that is not the cast with those who are Christians.